The retail market is getting more and more competitive every day. As new brick-and-mortar stores open, online shopping continues to thrive. With the trend to downsize – or “rightsize” – retail space continuing to gain momentum, maintaining product inventory to meet consumers’ needs in a smaller footprint becomes more challenging. And, to stay competitive, retailers must continue to find new ways to lower their prices, minimize overhead, and maintain profit margins. Recently, Vulcan Industries had the opportunity to collaborate with Office Depot to develop a unique solution for the ink and toner cartridge area in their new “Store of the Future” format. Replacement ink and toner cartridges became a critical item to the office products business once computers became a workplace and home office essential. With hundreds of choices, it is a high volume business with a need for constant replenishment of product. 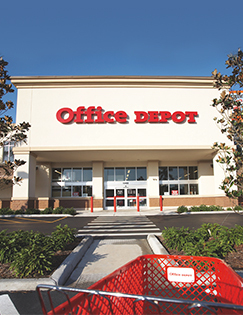 Getting additional inventory out of the back room is an issue Office Depot needed to resolve to keep associates on the floor and customers satisfied. Office Depot, like almost every retailer, uses gondola shelving to display their products. This particular style of retail shelving gives stores a great amount of flexibility, as shelves are easily adjusted. Typically, the bottom shelf, or “base deck,” sits six or seven inches off the floor, and below that is empty space, said Lee. Seeing that space, a light bulb went on. There are five big benefits to the drawer, and they could add up to some big advantages for Office Depot. Sometimes, employees spend a lot of time going back and forth to the stock room and the store shelving to see if an item is in stock. Each trip adds to labor costs. By reducing or eliminating these trips, workers can spend time on other tasks. Customers assume that retailers have a big storage room with a lot of merchandise. In fact, many have a small back room, or even no back room at all. Why? Because the more product there is in the showroom, the more product there is for customers to purchase. Eventually, the store shelf will need to be restocked. And when they do, it’s much easier and quicker when the merchandise is right there, sitting under the shelf. When employees are in the stock room, they’re not on the floor. And the fewer employees a retailer has on the floor, the harder it is for customers to find help when they need it. Customer service can make all the difference, and the more associates there are available, the better. It’s much easier and quicker to check on an item, so customers do not have to wait around. They can purchase their item quickly. Simplifying inventory control can help you operate your business in a more efficient way. Visit our web site to see examples of our many solutions or to schedule a meeting to see how we can serve you.